Did you know that many millionaires use coupons as part of their savings strategies? Find out why using coupons can be an important part of your financial portfolio. Imagine this scenario: Your employer hands you a check for $2,000 and tells you that the company has allocated "x" amount of bonus money for employees and $2,000 is your share. Would you throw the check away? Of course you wouldn't. You would put it in the bank and use it for bills or to buy something you want or need. Coupons work much the same way, except the payoff is in smaller increments. Companies allocate so many dollars a year to attract customers to their products, businesses or services. Some of the money is then distributed to shoppers via money-saving coupons. If shoppers throw the coupons away instead of using them, they do not get the savings. Surprisingly, only a small percentage of shoppers (about one percent) redeem coupons. U.S. Consumer Packaged Goods (CPG) marketers reportedly distributed coupons valued at $470 billion for products used daily like food, beverages, clothing, tobacco, and household items. The average coupon had a face value of $1.54. Only $4.6 billion coupons were redeemed. Coupons valued at $465 billion went unused. Shoppers using CPG coupons saved an average of $30 a week (or $1,560 a year) to $50 a week (or $2,600 a year), depending on their level of coupon involvement. According to labor statistics, the average household in the U.S. has revenues of $41,600 a year. The average annual raise is three percent, or $1,248. 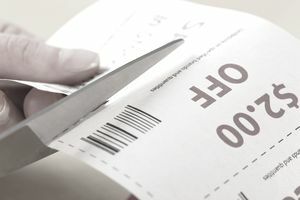 By using coupons, even on a casual basis, the payoff could be more than families will receive in annual pay increases, and yet 99 percent of us elect not to use coupons. Why do so many people resist using coupons? One reason is that some people are too embarrassed to use a coupon. They are afraid it will make them look cheap or people will think they are poor. Based on statistical profiling, households with an income of $100,000 or more and shoppers with college educations are twice as likely to use coupons than those who live below the average family income and those who did not complete high school. Another known fact is that many millionaires use coupons. In his book The Millionaire Mind, author Thomas J. Stanley writes about the frugal lifestyles that many millionaires choose to live. For example, many millionaires have their shoes resoled, they repurpose their furniture rather than buying new, and they use coupons. Why would millionaires bother with a dollar-off coupon? Stanley explains that millionaires look at the bigger picture. It is not about the money that they will save during one shopping trip, but rather the money that can be saved and invested during a lifetime by using coupons. He uses the example of how a family that spends $200 a week at the grocery store could cut the bill by five percent through couponing, buying in bulk, and using other cost-cutting practices. The money saved could then be invested and eventually grow to more than $500,000. Pursuing savings so as to reinvest them is the reason many millionaires also do meal planning and prepare shopping lists that they stringently follow based on their available coupons. Too Lazy? Too Disorganized? Too Busy? Have you noticed that most everyone is busy these days? We are all on the run keeping up with kids, jobs, maintaining our homes, educations, you name it. Snagging some extra time to relax can be a challenge. For some, the thought of adding coupon clipping to their schedule seems impossible. However, the coupon process of finding and using coupons has never been more streamlined. Today, shoppers can save by just handing a cashier their customer cards and having any applicable coupons automatically deducted from their grocery bill. No clipping is involved. Online resources for printable coupons are also super convenient. Most stores have websites that offer coupons either on the site or through email. Mall and outlet stores' websites often post printable coupons. Websites with printable grocery coupons are simple to search and to use. There are coupon computer applications that tell us what coupons are available. Doing a quick search on the internet will result in locating coupons for national stores. You can find information about discounts that credit cards are giving when shopping in specific stores. There are also thousands of coupon codes listed daily for extra savings when shopping online. Using coupons is a serious way to save money. It is not only about saving a dollar at the grocery store. The couponing mindset goes much further than that by forming habitual behaviors centered around saving on almost everything that is purchased. It's a lifestyle.